More info:From £2559 - £2699 excluding flights. Prices based on 2 adults sharing. Single supplement available. Mimimum age 14. This thrilling tour of the Caucasus region: Armenia, Georgia and Azerbaijan, has all the elements of a classic holiday. Over 19 days you will explore sacred sites, cosmopolitan cities, beautiful scenery and enjoy a rich variety of cultural encounters. A busy itinerary sees you on the move every day, whether it be to a monastery, a local winery, or a fascinating museum. You will travel as part of a small group accompanied by a knowledgeable tour leader, and enjoy an immersive, authentic look at a region that has only in recent years reached the tourism radar. Begin in the Armenian capital, Yerevan, to visit popular locations such as the Cascade and the Vernisage crafts market. Yerevan is an excellent base from which to visit must-see landmarks such as the Echmiadzin Cathedral, Armenia’s Mother Church and said to be the oldest cathedral in the world. You may even catch part of the Sunday service. 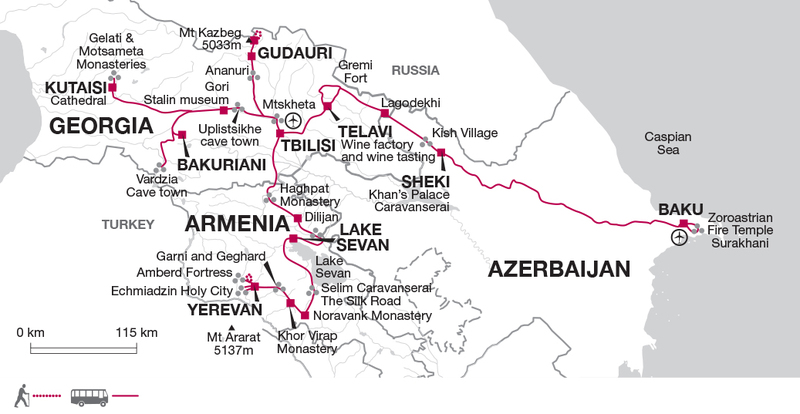 Via other well-known sites including the Temple of Garni and the Amberd Fortress you’ll continue on to picturesque Lake Sevan, Armenia’s most popular holiday resort, before crossing the border into Georgia. A guided tour of Tbilisi showcases highlights of the Old Town including the Sioni Cathedral and the State Museum. Just a handful of the notable visits you’ll enjoy in Georgia include the fascinating Vardzia Cave Town, carved into the cliffs from the 12th century, and the Stalin Museum in his hometown of Gori. From the resort of Gudauri you’ll do a little trekking in the Kazbegi Mountains, then continue on to the highly regarded Kakheti wine region where there will no doubt be time for some tasting. Finally crossing over into Azerbaijan, the tour takes you to Baku, with its Maiden’s Tower and Shirvanshah's Palace, and the remarkable Fire Temple nearby, on the Absheron Peninsula. And of course this is no more than a brief summary of an utterly spellbinding trip. You would be hard-pushed to find a better way to experience the Caucasus. Using local guides and crew is consistent with our policy to generate local employment and deliver direct economic benefits to the areas we are travelling in. We also do this by using locally owned hotels, spreading our business to a variety of local restaurants.